Visit of Dr. Hassan Diab, AUB�s Vice President for the Regional External Programs Office to the Lebanese Business Council Visit of Dr. Hassan Diab, AUB�s Vice President for the Regional External Programs Office to the Lebanese Business Council The Lebanese Business Council received Dr. Hassan Diab, Vice President for Regional External Programs (REP) at the American University of Beirut (AUB) on the 16th & 17th of February 2014. During this two-day visit Dr. Diab met with prominent Lebanese businessmen in Abu Dhabi. 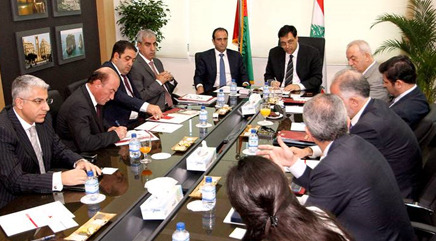 Those meetings were held to discuss the possibility to provide academic and consulting services In his overview about REP�s Dr. Diab summarized the various offerings as follows: � Provide technical assistance and consulting services to academic institutions of higher education and K-12 schools for both private and public sectors. � Provide technical assistance and consulting services to medical institutions, relying on the international experience of the faculty and physicians of the American University of Beirut Medical Center (AUBMC). � Provide customized training programs and executive education � Provide continuing education services, through REP�s Continuing Education Center (CEC), in the form of certificate programs, and diplomas to individual professionals in various disciplines. The attendees expressed high interest in pursuing areas of collaboration with AUB to benefit from its large portfolio of academic and professional services and capabilities that are put at their disposal.